Connection to an external electricity supplier. Absolute dependence on its pricing policy + on development of electricity prices on the market. Very low bargaining power (single building). Advance payments + annual settlement of accounts for heat according to final readings. A very uneconomical and not very environmentally friendly solution in the case of older buildings. A frequently undersized solution or one which no longer meets the requirements of the current operating regime. Need for regular inspections, servicing, replacement of individual parts, regular readjustment – arranged by an external company subject to a fee or by employees themselves between individual inspections (often intuitively). Almost impossible to predict a problem and resolve it in time. If no service contract is concluded with nonstop on-call service, resolution of the problem takes days, not minutes or hours. Absolute dependence on the supplier, its pricing policy + on development of electricity prices on the market. Often absurdly high prices per unit. Very low bargaining power (single building). We install our micro power plant in your boiler room and operate, optimise and service it for a period of 10 years. Our monitoring centre is permanently connected to the equipment and knows about every fluctuation or change in good time. Service technicians are able to resolve any problem which may arise quickly and effectively. An OnSite Power micro power plant is equipment the size of a passenger car engine. At its core is a next generation cogeneration unit – a combustion engine with a generator which produces heat and electricity from natural gas with a high level of efficiency (approx. 95 %). The engine powers a generator which produces electricity. The water cooling for the engine is a source of heating and preparation of hot water. One small unit with an output of 30 kW of electricity and 60 kW of heat can save you up to hundreds of thousands of crowns a year. Larger units (starting from 200 kW of electrical power) can generate savings of as much as millions of crowns. The unit is installed in your boiler room. It mostly does not replace but augments and supplements the existing equipment. This is one of the most efficient methods of producing heat and electricity. 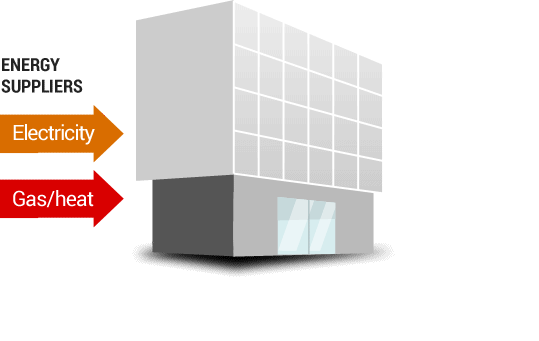 The location of energy production directly in the building where it is consumed means that there are no distribution losses. This, together with a high level of efficiency, is your guarantee of favourable energy prices. The micro power plant does not replace the original equipment in the boiler room. It complements and accelerates its output. It reduces costs for energy consumed as well as costs for renewal, management and servicing the original boiler room equipment. You don’t need to cancel your contractual obligations with the suppliers of heat and electricity – on the contrary, we will leave these as a back-up for the event of your energy consumption being greater than the micro power plant is able to produce. Everything takes place in a fully automated manner. The consumer doesn’t even know that the additional production source has been activated. The consumer (operator or owner of the building) only pays for the actually consumed energy and heat. The price of this is 15–30% cheaper. We are able to calculate savings in advance and guarantee them for the whole period of operation of the equipment. The micro power plant produces power at full capacity all day long. 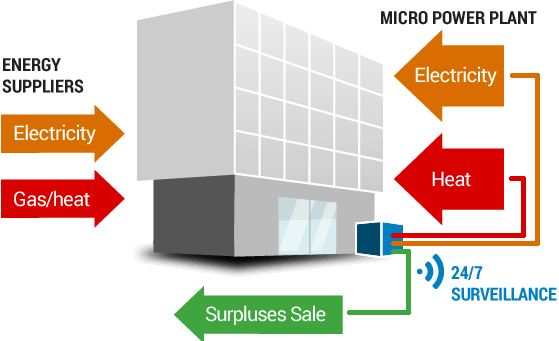 Unused electricity which remains is automatically sold on the energy exchange via the distribution network. We use the proceeds from these sales, economies of scale and use of the options offered by “green bonuses” to gradually amortise purchase of the micro power plant, costs for operation and optimisation – and after several years, in our capacity as the investor, we eventually also achieve a reasonable profit. We are only able to do so thanks to the fact that we operate a lot of similar equipment. Have a look at our installation references! Leave us a contact and we’ll get back to you.